The word app is short for application, these are simply extra little computer programs (or software) that you can download into a smartphone and which will then do a particular task for you. In the last few years literally thousands of apps have been developed as the popularity of smartphones and so the demand for apps has increased. Early apps did jobs like adding email onto your phone or a calendar. These functions are required by everyone nowadays so smartphone manufacturers give you them for free already built into the smartphones software. 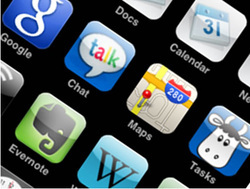 Apps usually use the certain parts of the smartphone to create a unique function. The app can use the camera to take a photo of either an injury you may of sustained to be relayed back to a Doctor for assessment, or photograph a landmark to help your rescuers locate you. The app can use the camera flashlight to send out a morse code SOS light signal to help guide rescuers to you. Then tell you where your nearest restaurant is located and give you exact directions of how to get there. The app can also use the phones internet connection to communicate directly with the restaurant and book your table or order a take-away food order. The app can also use the camera to allow you to take a photo (of your meal, your friends, whatever you like) and share it through your favourite social media site on your phone. Finally you can rate how good - or bad the meal was providing feedback for the restaurant and allow them to contact you in the future with special offers and promotions. Finding and buying phone apps is straightforward. Many are available free because the company behind the app is making money just from you using their app - like the example restaurant app above, or some apps will have advertising running on them which covers the costs. Beware that there are some apps which require a subscription payment. This is very common in game apps where you start with a free trial (to get you hooked) but then move on to paying for credits to get more features or playtime. Many of this type of app is aimed at children. One important rule is that you need to buy the correct version of app for your particular phones operating system. So for a Window's phone you need a window's app, an apple phone needs an apple app, etc. Because of this each of the four main phone operating systems have their own app stores. In the app store you can browse through the apps and then download the one you want directly onto your phone. This is usually straightforward. Remember that a phone app will use up a chunk of your phones memory and this may limit how many apps you can install or you may need to add some extra memory into your phone with a micro-sd card. To install a phone app, you will typically either drag and drop an icon to the phone or click a button to agree to the installation. Uninstalling one is also straightforward, and typically involves deleting or dragging the icon away from the phone. Tip : When you uninstall a phone app, you may also lose all the data relating to it because, in many cases, it is not stored separately.